North Star Energy LLC services approximately 4500 propane customers in South Dakota and North Dakota. We provide propane bulk, cylinder, cylinder exchange and transport service for residential, commercial, industrial and agricultural uses. Our fleet of propane vehicles includes: 11 Propane Bobtail Delivery Trucks, 1 Cylinder Delivery Truck, and 6 Service Vehicles. Our service department installs and services propane tanks, furnaces, boilers, space heaters, fireplaces, air conditioners, heat pumps, and much more. North Star Energy maintains supply connections with several different suppliers of propane at terminals close to our bulk plants. 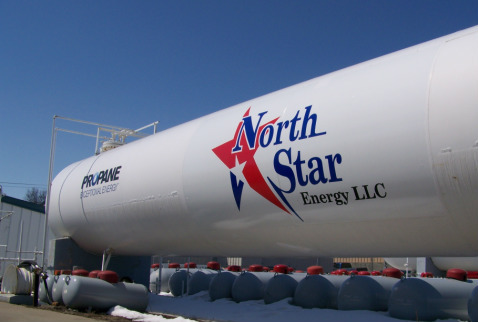 With propane storage of over 475,000 gallons, North Star Energy is prepared and able to provide our customers with a dependable supply of propane. We also have ability to receive railroad tank cars. Much of this propane is under contract and is available when we need it. We have the ability to go wherever we must to supply our customers with the propane they need. North Star Energy, LLC takes great pride in being a complete and reliable propane marketer. Our vision for customer service is inspired by the policy of TRUTH, HONESTY AND INTEGRITY in everything we do. Our employees are your neighbors. They live and work right in your home town. We invite you to experience our courteous, dependable, world-class service.